This section is primarily based on the original research conducted by Victor Allard, Nicklas Broberg, Emilia Danielsson, Erik Elmtoft, Gustav Lindström, Maria Nelénius, Christoffer Ohlander, Karl Samuelsson, Emelie Torgnysson, Robert Wallberg, Petter Åslund and Joel Österqvist. A copy of this group's original work can be downloaded here. Industry Park of Sweden (IPOS) has its history in different chemical and minerals industries, mostly under common ownership, and since its earliest days has emphasized the importance of symbiotic relations. Revalorizing diverse waste and by-product streams both on input and output sides have in times served the companies on the site as a survival strategy. Today, IPOS continues to host and further develop synergistic relations linked to material and energy exchanges, utilities, and services that benefit the environment, the businesses in the park, as well as neighboring city of Helsingborg. 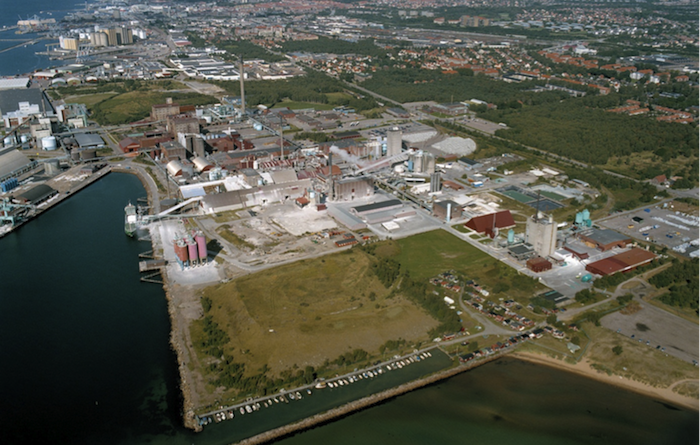 Industry Park of Sweden (IPOS) is located in south of Helsingborg, in south-western Sweden. Covering approximately an area of 1 km2, IPOS was originally part of the Kemira Group. Today it is part owned by Coor Service Management and is managed by a separate organization within Kemira Kemi AB, with responsibilities for energy and park development. There are a number of plants owned by different companies and conducting different operations in IPOS. In the evolution of the industry mix of the park, supply synergies have always played an important role and currently there are exchanges of materials and energy between different plants. In addition, the park management provides centrally coordinated services for the supply of energy, water and compressed air, for waste and wastewater management, logistics, site development and safety, and training. Such centrally coordinated services benefit from “scale economies” and are therefore more efficient and less costly. In addition, IPOS has synergistic relations with the neighboring city of Helsingborg, with which it exchanges various resources. Energy exchanges between different actors in IPOS, as well as with the neighboring city of Helsingborg, form the most notable synergistic relations. In addition to these, there are also material exchanges, which primarily take take place among Kemira’s production facilities, but also to somewhat minor extent between the other companies in the park. Energy exchanges withing and around IPOS, and the material exchanges within the park are depicted in Figures 1 and 2, respectively. Figure 1: Energy exchanges within and around IPOS. Figure 2: Material exchanges among different actors in IPOS. IPOS has an extensive network for distribution of steam, hot water, natural gas, compressed air, electricity and water to the companies in the park. All distribution is done through the energy central, which is a key element of IPOS. Centralised compressed air system in IPOS. Some companies in the park, and most notably the sulfuric acid plant, generate excess heat. Much of this excess heat is directed to the energy central and is converted into electricity, steam of various pressures and hot water. Around 50 GWh of electricity is produced annually and is used internally in the park, accounting for a third of the park's electricity demand. All heating needs of the companies located on the park are also met by the energy central. The energy central is also responsible for purchasing electricity and natural gas from external sources and distributing these to the companies in the park. The central has a pump station and treatment plant that supplies the entire park with cooling water. IPOS also distributes feed water, deionized water and municipal freshwater. In addition, all residual water flows in the park are managed by IPOS, who is responsible for the sewer system. 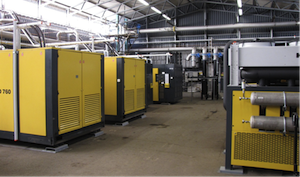 In 2010 a centralized compressed air system was built in the park, replacing several separate compressed air stations at various facilities and offering considerable efficiency gains. The sulfiric acid plant owned by Kemira Kemi AB is a central actor for the synergistic relations in the park. This plant provides approximately 600 GWh of excess energy to the energy central, corresponding to 90 % of its heat input. Excess heat from the hydrogen peroxide plant and the plant producing sodium percarbonate is sent to the energy central. Together, the two plants provide 60 GWh of heat energy. These plants also have bilateral exchanges. ECOX receives its hydrogen peroxide input from the plant located on the park. In addition, for its dry granulation process ECOX uses by-product steam at 19 bar from the hydrogen peroxide plant for preheating. This enables ECOX to reduce it natural gas consumption by 30%. IPOS maintains several of synergistic relations with the nearby city of Helsingborg, and most notably its energy company Öresundkraft. Since 1974 the energy central of IPOS provides hot water to the city’s district heating system, currently covering around 35% of heat demand of the system. Whenever there is enough capacity, IPOS also provides Öresundkraft with deionized water – used as make-up water in the city’s district heating network. There are processes at the IPOS-site which calls for access to an industrial fire department. Due to this, IPOS is also co-operating with the fire department of Helsingborg. This has resulted in that the fire department receives training in the processes which occurs at the IPOS-site. Another part of this collaboration is that certain staff at IPOS and Kemira are prepared for advising the fire department in case of chemical accidents in southern Sweden. This is an example of a knowledge exchange in both directions and how public private partnerships can be formed to reach mutual benefits as well as increased safety for the public. There is also low-grade waste heat available from the sulfuric acid plant that is not feasible to utilize for steam or hot water production. This low-grade waste heat is provided to the by Scandinavian Silver Eel AB, which uses the heat to generate optimum growth conditions (water at 23-25 oC) for accelerated eel growth. SITA waste management company uses heating provided by the energy central in its cleaning operations. SITA also provides waste management services to some of the operations located on the site. Energy Effciency and GHG emission reductions: The energy carriers provided by the energy central can be considered carbon neutral as no extra fuel is used to produce electricity and heat and most of the excess energy comes from sulfuric acid production which is free from carbon emissions. This has positive implications on the carbon footprint of energy used within the park as well as the part used in the district heating network of the neighboring city. Having a centralized compressed air system reduces electricity consumption in the park as compared to each plant having its own compressed air system. This is thanks to the use of more efficient compressors and the ability of the energy center to optimize the compressed air usage in the entire park. This reduces the electricity consumption and consequently associated CO2 emissions. Other emission reductions linked to centralized supply of cooling– and demineralized–water are likely to be present. By substituting part of the natural gas used in ECOX by heat provided from the hydrogen peroxide plant, carbon dioxide emissions are reduced by roughly 7500 tonnes every year. CO2 emissions linked to SITA's operations are also reduced, partlly because the company no longer needs to use oil-fired boilers, and partly because they have reduced transport needs while serving the customers located in IPOS. Reduction of fossil fuel usage: Utilization of around 660 GWh of excess heat from different production facilities eliminates the need for using other fuels, including fossil based ones, for the production of various energy products used in the park. Companies located in IPOS have access to low-cost and reliable supply of energy carriers including electricity, steam and heat, and natural gas. Cost advantages arise not only from the ability of IPOS to generate electricity and heating products from excess heat available on the park, but also from their ability to negotiate better contracts with external suppliers as a biger buyer. Additional economic benefits are provided to companies through reduced grid costs and reduced peak demand costs. For one of the newer tenants of the park – SITA waste management services – availability of competitively priced energy has been an important factor in their decision to locate their operations in IPOS (In its previous location, SITA was using fuel oil for producing the hot water it uses). Having a new tenant with heat demand was also beneficial for the park management. In addition, SITA was able to reduce transport costs for the customers it serves within IPOS. The economic and business advantages are not limited to IPOS, but extend to Öresundkraft and the city of Helsingborg, which benefit from receiving heating from IPOS. The companies that can be considered ancestors of IPOS regarded waste and by-product revolorization highly important. This approach has helped these companies to survive economic downturns. Consequently, the management of IPOS is highly familiar with the benefits linked to diverse synergistic connections and thus actively seeking to identify and operationalize additional synergies. For example, in selecting new tenants that can establish operations on the avaiable land managed by IPOS, potentials for integration with other activites on the site plays an important role. In IPOS good communication is seen as a key enabler of creating synergistic relations. A well-functioning communication makes it easier for the involved parties to realize that cooperation can be mutually beneficial. Lack of communication will often lead to sub-optimization according to IPOS. Communication and circulation of information within the business park is done both through work-related and informal forums. Some examples of informal forums are a whiskey club, sports clubs and a shared sauna. Through communication with the other companies ideas are exchanged, partnerships are created and opportunities for improvement are identified. Thanks to these informal meetings social bonds across company boundaries are also created, thus facilitating the process of asking for help or knowledge. Using waste heat for district heating was relatively unusual in Sweden in the 1970s. For the establishment of this cooperation, supportive mindsets of the CEOs of both the energy company and Kemira Kemi of that time is believed have played an important role. There was a clear economic motive for IPOS to sell its excess heat. The project was also attractive for the city's energyt company as it offered an alternative to reduce primary fuel consumption for the production of heat at a time where there was an oil crises. The company was thus willing to financially support the necessary physical connection. What is most certain, however, is the subsidies provided by the government in support of the project. These collectively contributed to shortening the payback time for this initiative. The initiative has also helped improve IPOS' public image, as excess heat was no longer discharged to the sea. The energy strategy adopted by the municipality of Helsingborg, which invokes the usage of waste heat, is another important leverage point. The municipality also has the vision to provide a heat production free from fossil fuel by 2020. The heat delivered by IPOS to the municipal energy company, Öresundskraft, has an important role to play in realising this vision. . Both parties want to increase the amount of delivered waste heat, in case more waste would be available in the future. This is feasible due to the fact that the capacity of the district heating network is greater than the current usage of it. Öresundskraft and IPOS are working together to find solutions which would result in both financial and environmental gains. A government program aimed to combat the decreasing eel population, where the government bought elvers (ca one gram each) and released them in water streamswas a contributing factor for the establishment of Scandinavan Silver Eel. According to IPOS, marketing is one of the biggest obstacles in the development of the industrial park. The added value for companies establishing in the park is often in the form of long-term synergies, which are often overlooked in favor of establishment grants from municipalities. Hence it is very important for the IPOS management to clearly communicate all the possible benefits of a compatible new activity to establish in the area. For example, currently 24 MW of high quality energy (in the form of steam) is downgraded for the production of hot water for district heating. Creating conditions to increase demand for such will present a more sustainable alternative. Something that may affect the future development of IPOS is a joint project by Öresundskraft and the regional waste management company NSR (Nordvästra Skånes Renhållnings AB), where they construct a new combined heat and power plant. This waste incineration power plant has a total power of 85 MW. When this plant is in operation, the supply of heat in the region will surpass the total heat demand during the summer months (approximately 45 MW), introducing the risk for IPOS not being able to provide its excess heat to the district heating system. To prevent this, Öresundskraft has scheduled four week of auditing the middle of each summer, and the power plant will run at partial load the weeks before and after this production stop. However, for Öresundskraft and NSR, it might be difficult to economically justify less production in the waste incineration plant in favor of waste heat from IPOS. It is important that Helsingborgs municipality continue to work with the current energy policy prioritising the use of waste heat. By the time this research was conducted, IPOS was actively investigating the possibilities for finding new uses for different material by-products produced in the Park. There was also on-going work investigating the possibilities for waster cascading between different facilities. Another future improvement at IPOS would be to expand the steam distribution network to Alufluor and thereby make it possible for them to use steam in their process. 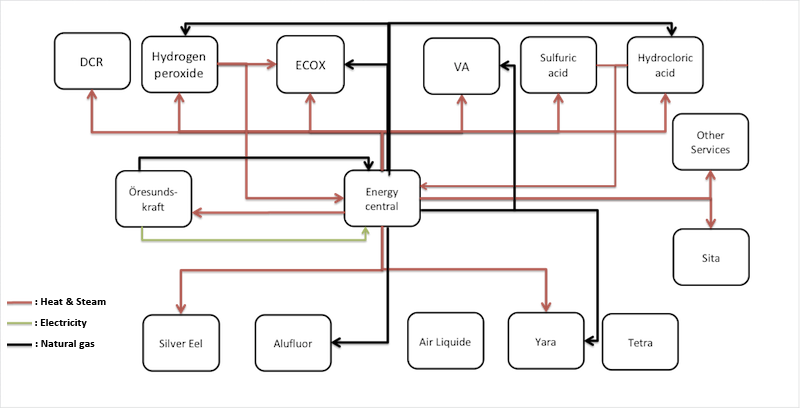 By expanding the heat water network to Alufluor it might also be a possible to use their waste heat. Today, Scandinavian Silver Eel pays pig farmers to get rid of wet biological sludge – a waste product from the water purification process. One option would be to use this sludge for producing biogas and use the digestate from biogas production as soil enhancer. One of the barriers against the implementation of this option is the excessive water content of the sludge, which requires some form of dewatering. The main environmental benefit connected to this synergy is the replacement of fossil fuels in vehicles and thereby less emissions of carbon dioxide. Another potential synergy could be to build a farming facility for mussels in Öresund. The shells, with their high level of calcium carbonate, could possibly replace parts of the virgin limestone used in the factory producing calcium chloride. By mincing down the mussel meat to flour it could be used as feed to the eels. This project may lead to reduced eutrophication in the Baltic Sea, reduced resource use of limestone and improvements due to the displacement of conventional feed. However, there are several uncertainties and barriers related to the project. First there is the risk of slow growth among the farm-raised mussels making the project less profitable. It could also be difficult getting the eels to appreciate the mussel feed and there are uncertainties regarding health effects in the long run. There are also possible technical barriers related to the replacement of limestone in the production of calcium chloride. To overcome these barriers the conditions for mussel farming must be thoroughly investigated and alternative uses of the mussels should be explored. One alternative is to use both the flour and shells as feed in another farming facility, where the crushed shells act as a natural lime addition.